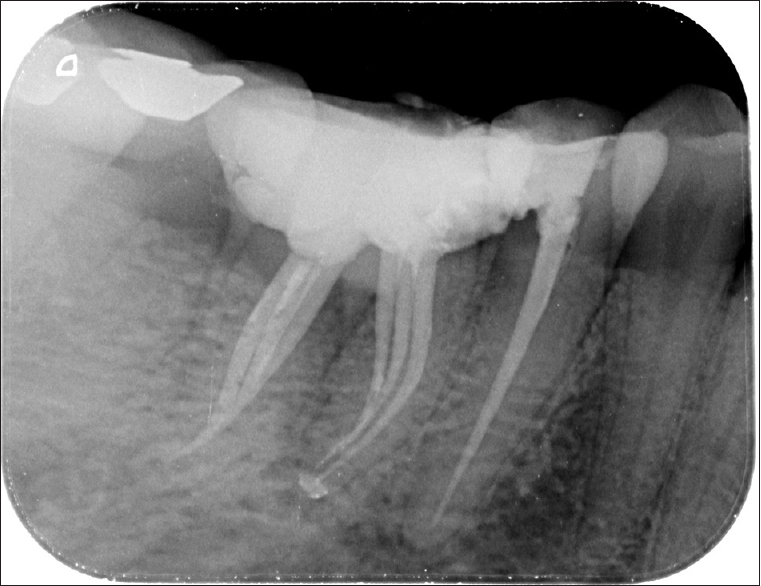 Managing aberrant canals can be crucial, but the inability to find additional root canals may cause failures. Six root canals in mandibular first molars are unlikely, but the individual case should be evaluated carefully both clinically and radiographically to identify any anatomic anomalies. Probable aberration in the internal anatomy of human teeth should be known to assure favorable endodontic treatment. Till date, the presence of more than two canals in the mesial root of mandibular molars has been illustrated in few clinical case reports. Amidst these, the percentage of middle mesial canal (MMC) in the lower mandibular molar is 1%–15%; also called “intermediary mesial canal” or “medial mesial canal.”,,,, Kottoor et al. and Ahmed et al. found a prevalence rate of 4% and 3% for 3 canals in mesial and distal roots. Intraoral periapical radiograph is necessary for the assessment of the canal number and morphology although it has its inherent limitation. 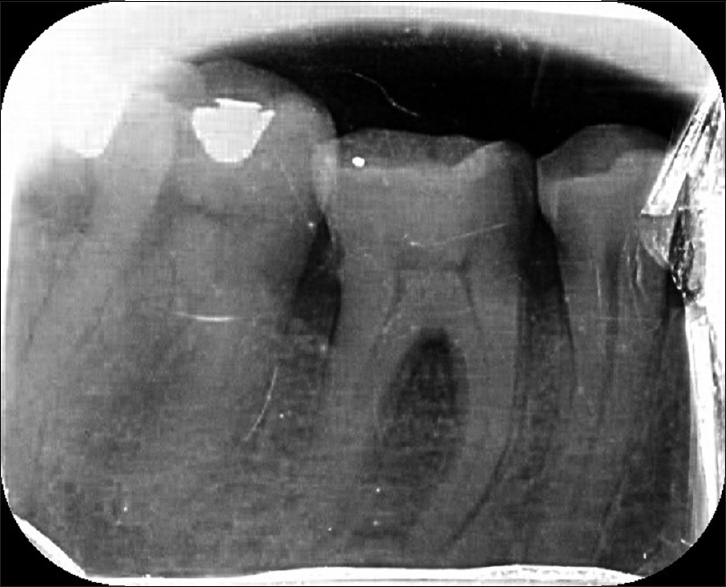 However, precise inspection of root canal configuration can be done through discrete diagnostic methodologies such as magnifying loupes, dental microscope and auxiliary diagnostic aids like cone beam computed tomography can also be used. A 35-year-old female patient reported to the Department of Conservative Dentistry and Endodontics with the chief complaint of pain in the posterior right mandibular region for the past 3 months. Her medical history was noncontributory. Clinical examination unveiled a carious mandibular right first molar (46). The preoperative radiograph of 46 [Figure 1] showed mesio-occlusal radiolucency involving the pulp with slight widening of the periodontal ligament space. 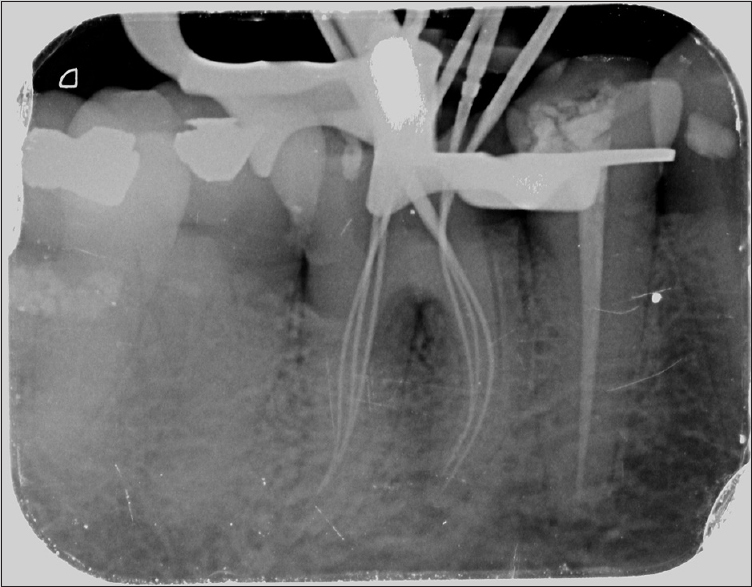 The clinical diagnosis of chronic irreversible pulpitis was made, necessitating endodontic therapy. After local anesthetic was administered (lidocaine 2% with epinephrine 1:80,000) and rubber dam isolation, all carious tissue was excavated, and an adequate coronal access was made. 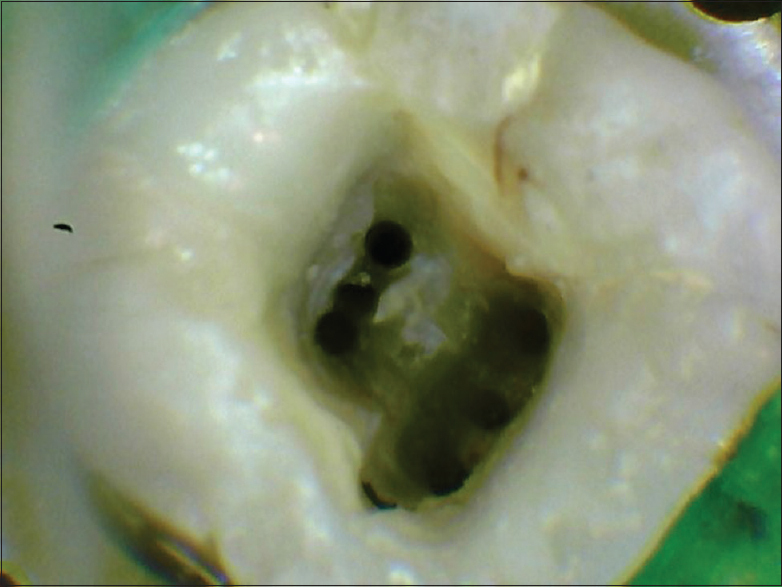 Clinical inspection of the pulp chamber floor revealed orifices corresponding to the mesiobuccal, mesiolingual, and distal canals. 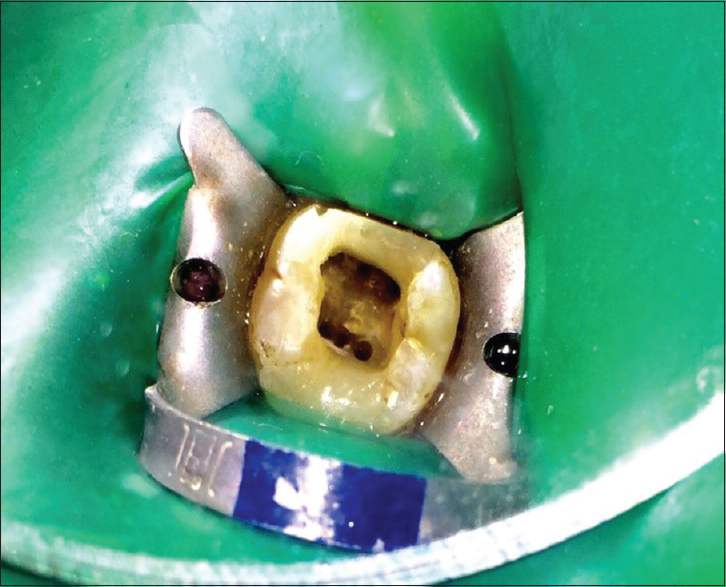 However, on thorough observation with magnification (2.5x loupes, Carl Zeiss, Germany) and exploration using DG-16 explorer (Hu-Friedy, Chicago, IL, USA), the middle mesial and middle distal canal orifices were identified and subsequently negotiated [Figure 2], [Figure 3], [Figure 4]. 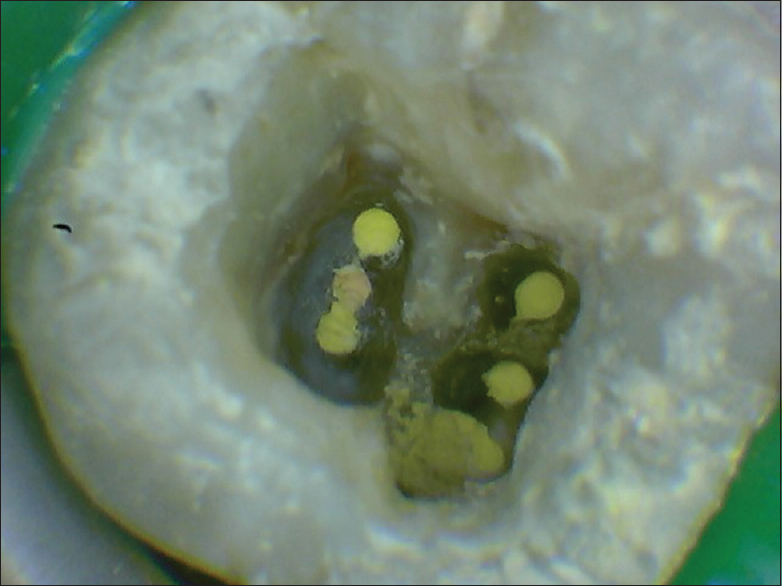 Each root canal was prepared using Hyflex rotary instruments (Coltene, USA) in a crown-down technique. Irrigation was performed after instrumentation with each instrument using 5.25% sodium hypochlorite solution (Novo dental products Pvt., Ltd, India), ethylenediaminetetraacetic acid (Glyde, Maillefer, Dentsply, Switzerland) and subsequently flushed with sterile saline. The canals were dried using paper points and a calcium hydroxide dressing was given. At the next visit after 7 days, the tooth was asymptomatic and obturated using cold, laterally condensed gutta-percha (Dentsply, Maillefer) and AH-Plus sealer (Dentsply, Konstanz, Germany) [Figure 5], [Figure 6], [Figure 7], [Figure 8]. The mandibular first molar is the earliest permanent tooth to erupt and is generally described as a group of teeth with two roots, mesial, and distal root. It is the most common tooth to undergo restoration and root canal treatment. The presence of two canals in the mesial root and one in the distal root of mandibular molars is 65% and the percentage of two canals in the distal root is 30%. The incidence of MMC has been reported to vary between 1% and 15% and that of middle distal canal in mandibular first molar to vary between 0.2% and 3%.,, Although anatomical aberration in mandibular first molars is corroborated in the literature, variations in the anatomy of these teeth are not acknowledged by a great many dentists. In the present case, the canals could be easily located by following the pulp chamber floor anatomy and application of basic concepts. Additional canals in mandibular molars are generally hidden by a dentinal projection which is lighter in color as compared to the pulp chamber floor. 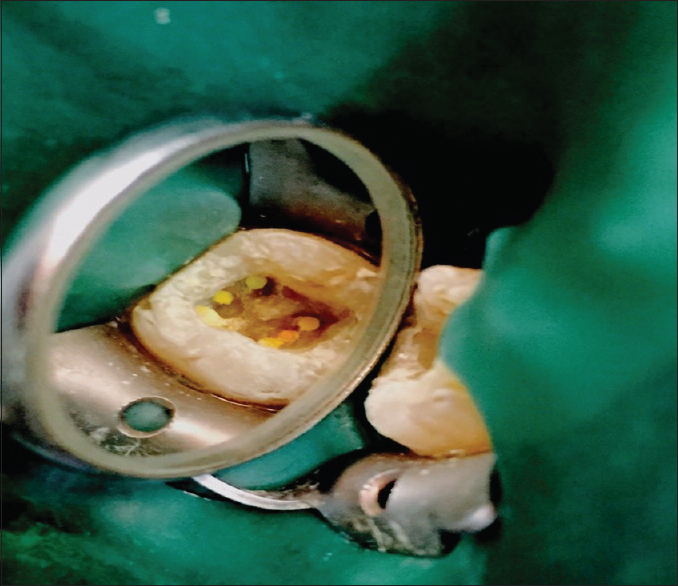 Loupes were used during the procedure as it increases the possibility of detecting additional canals. 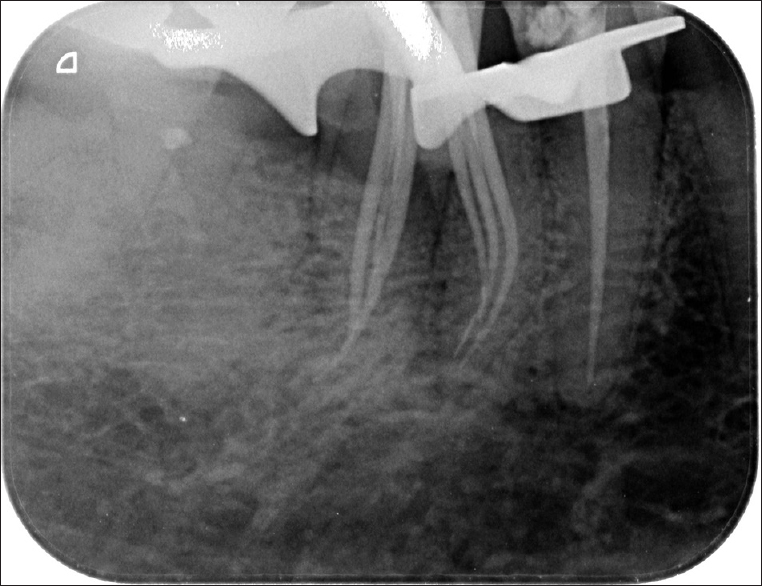 Thus, judicious interpretation of angled radiographs, definite access cavity preparation and a thorough exploration of the pulp chamber under magnification, are fundamental prerequisites for a favorable treatment outcome. The authors deny any conflicts of interest with respect to the authorship or publication of this article. Beatty RG, Krell K. Mandibular molars with five canals: Report of two cases. J Am Dent Assoc 1987;114:802-4. Reuben J, Velmurugan N, Kandaswamy D. The evaluation of root canal morphology of the mandibular first molar in an Indian population using spiral computed tomography scan: An in vitro study. J Endod 2008;34:212-5.